In a previous post, I noted the recent commemoration of the line of Offa’s Dyke as it crosses the Clywedog west of Nant Mill. At that point, a tree has been carved with a sculpture commemorating Offa and ‘his’ dyke. Here I wish to report on another ‘modern’ feature marking Offa’s Dyke. 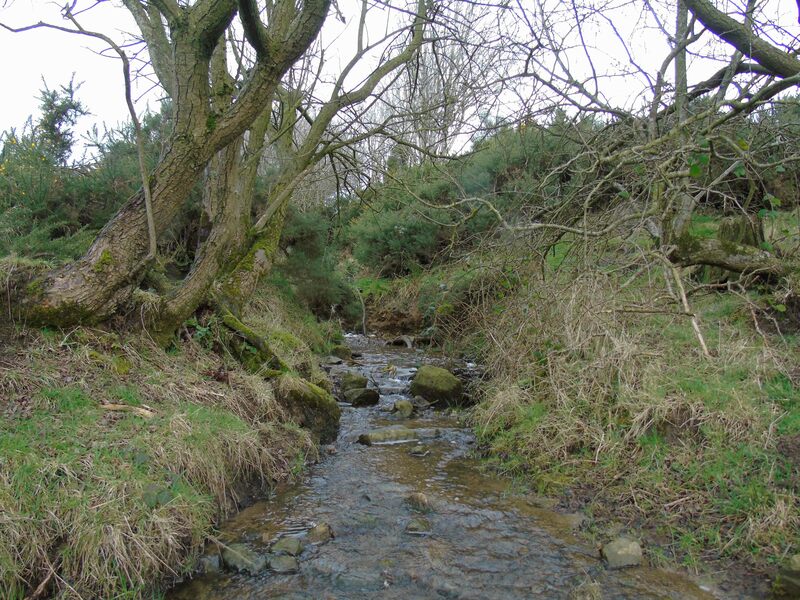 It is probably not insignificant that it also defines the historic border between England and Wales, close to where the dyke descends from the western slopes of Selattyn Hill to cross the Morlas Brook at Craignant. It is of further significance that the monuments lines a roadside that transects the line of the early medieval linear earthwork: roadsides are the stereotypical location for many 19th-century memorials, and so the monument achieves its purpose of being seen, and marking the dyke. The feature is a masonry tower with a plaque on the north-facing (road-facing) side inscribed ‘Offa’s Dyke’. A square masonry tower built into Offa’s Dyke where is it cut by the B4579, on the border between Wrexham County Borough and Shropshire. At the top of the tower, on the side facing the road, is a stone plaque inscribed ‘OFFA’S DYKE’. The record also quotes the anonymous 1868 A Handbook for Travellers in North Wales in stating that the tower was built to mark the course of Offa’s Dyke by one ‘Mr West’. This is evidently therefore an early/mid-19th-century folly. However, it is more than just a tower and a marker, it is a ‘fortification’. In symbolic terms at least, it evokes medieval architecture in crude terms, and thus the popular 19th-century idea of the dyke as a wall, akin to Hadrian’s. Indeed, contrary to the HER description, this isn’t an isolated tower, but it seems to be part of a wall which looks broadly contemporary, that tops the dyke for a stretch as it navigates diagonally the steep slope up the hill to the west of the road. 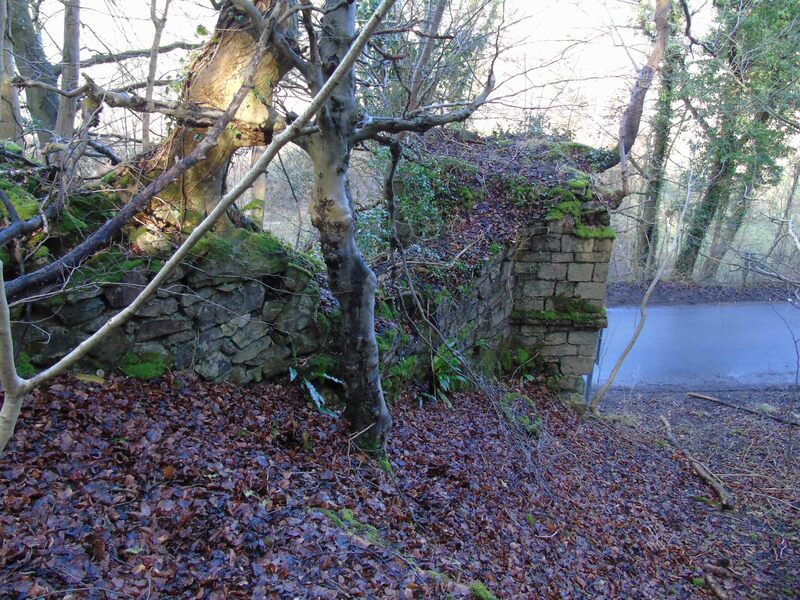 A further wall adjoins the tower and follows the road westeward. 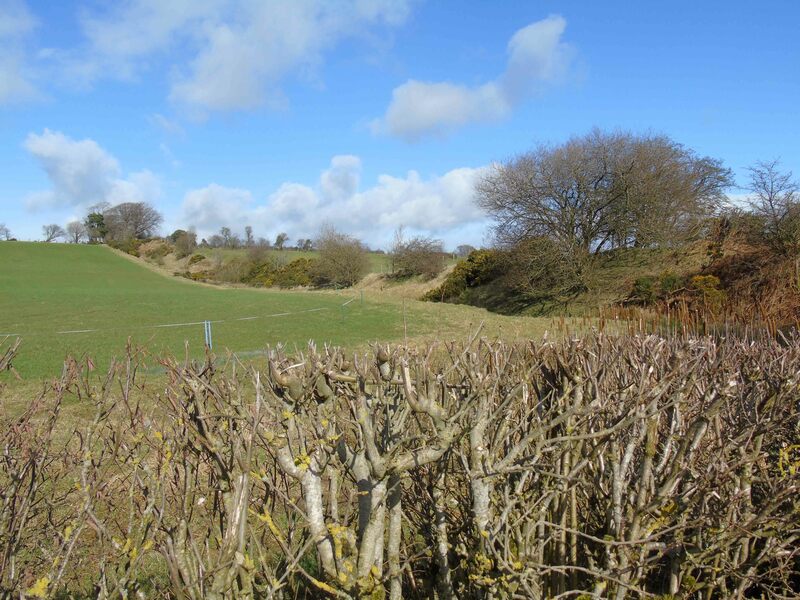 Therefore, from the road and approaching from the Welsh side, one encounters a tower and the early medieval dyke emphasised by this stretch of walling conjoined to it. As a monumental building to commemorate a far greater monument, it is an unoccupied tower with a stretch of masonry walling appended to it and thus it seems to have been built to enhance the ruinous appearance of a dyke that failed to look ‘ruined’ enough for 19th-century tastes. In other words, it failed to display dilapidated stonework, and so this feature creates the sense of it. Indeed, it might have also been intended to imply ruination by its partial character. The wall doesn’t stretch far. Moreover, as a monumental gatepost, was it intended imply a lost twin on the other side of the road? Marking the road and the dyke, Craignant Tower is a rare example of a 19th-century monument commemorating an early medieval monument. 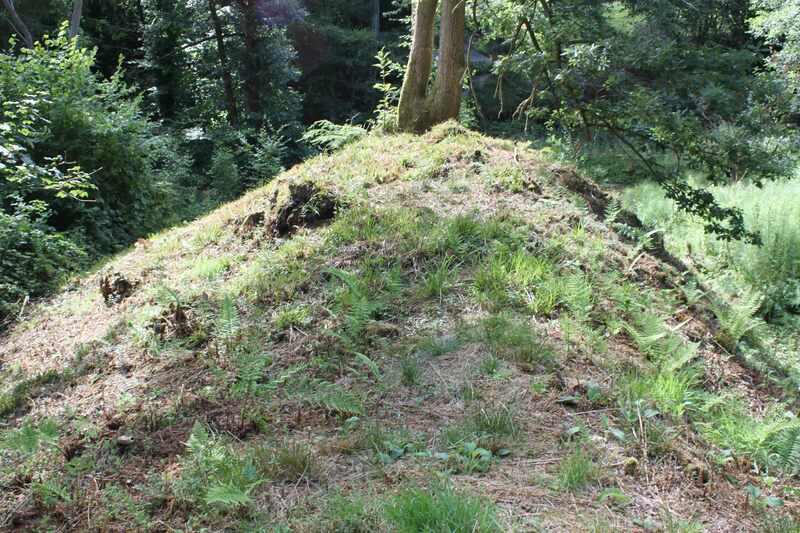 Recently, I went on a walk to check out Pen-Y-Gardden (Y Garden) hillfort to the west of Ruabon. 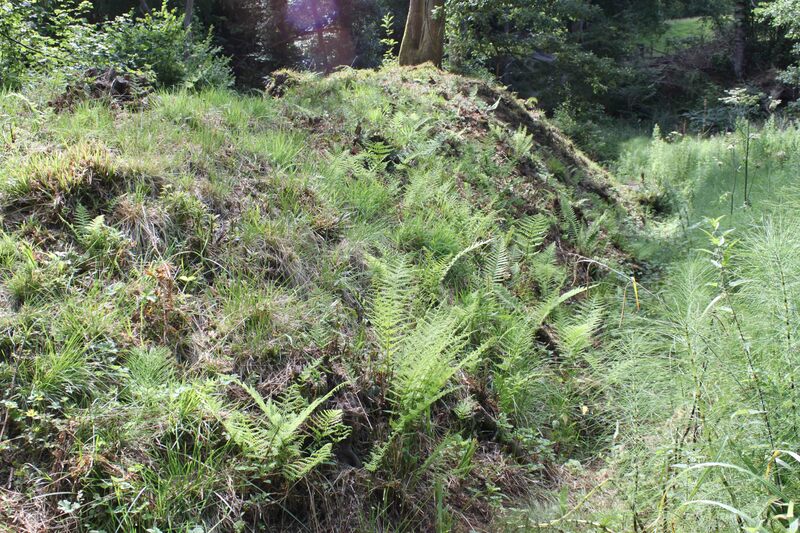 The hillfort is presumed to be Iron Age. It is itself is on private land but the public right of way follows a lane around its western and north-western sides. The interior is fields and woods, the line of the earthworks almost completely covered by vegetation and modern field boundaries. 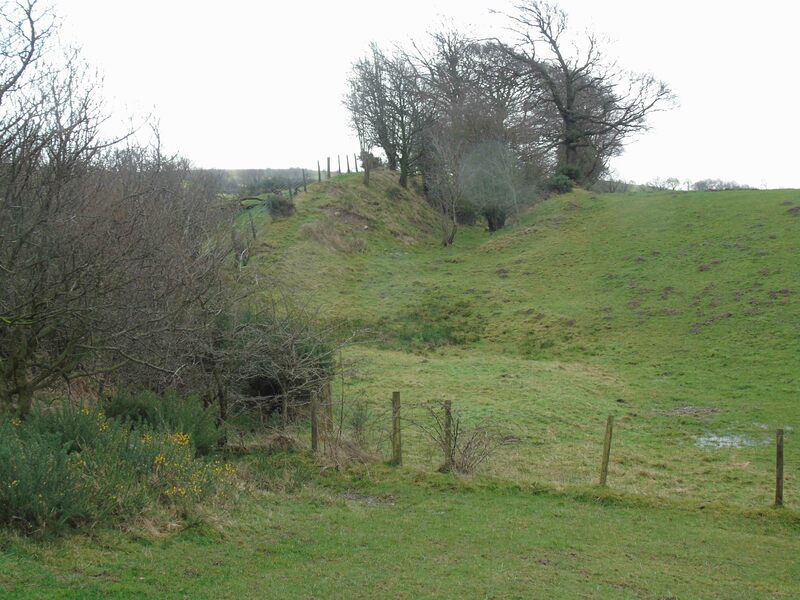 The HER record suggests that it may have originally been a bivallate hillfort. On its southern side, it strikes me as perhaps once being a trivallate hillfort. 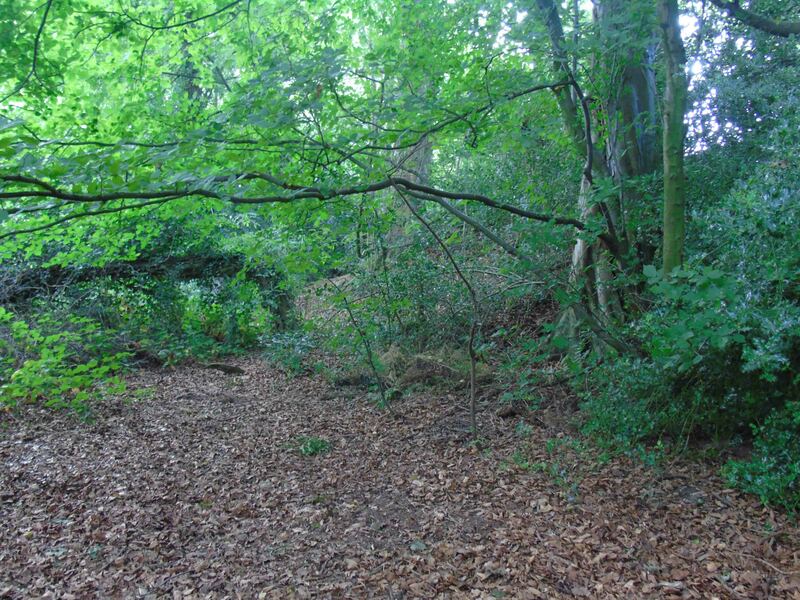 I say this because while I couldn’t fully investigate due to heavy vegetation, there seem to be two banks but a ditch upslope of the top one: perhaps a third bank existed above this and is now denuded. For much of its line, Offa’s Dyke follows topography that affords it long-distance views to the west. 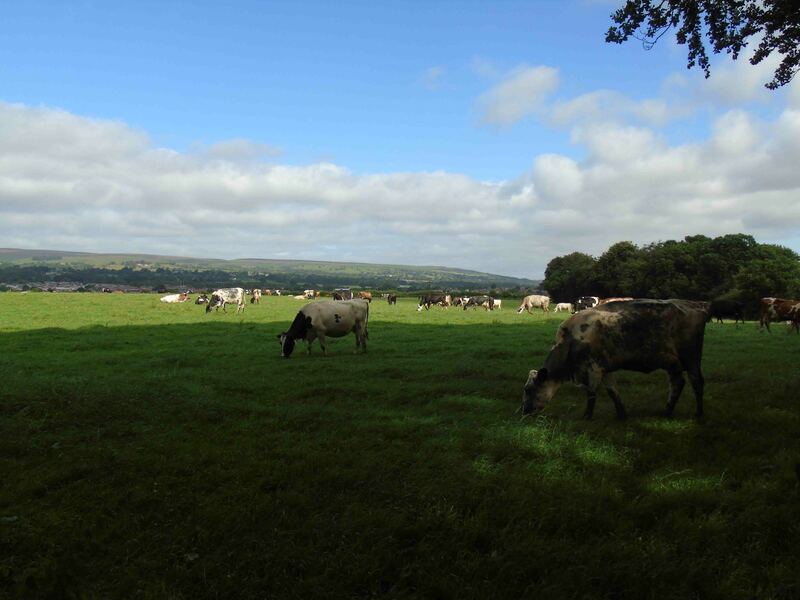 Y Gardden is a challenge to this situation, because the spur blocks views from the Ruabon section of Offa’s Dyke, downhill to the east of the hillfort. Hence, this hillfort has been the subject of considerable discussion given its close proximity to the west of Offa’s Dyke. Why did the late eighth-century Mercian frontier work go east of this prominent and defensible pre-existing earthwork? Was it because the site was an early medieval stronghold of Welsh forces and held against the Mercians, so there was no option of including it? 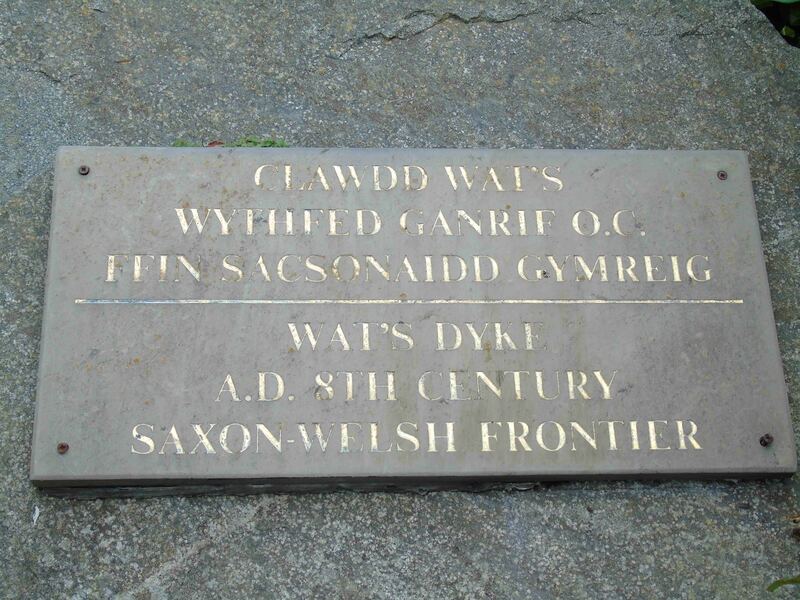 Was the line of the dyke agreed in negotiation between the Welsh and Mercians as Fox suggested, and therefore it respected pre-existing boundaries? There are two further scenarios worthy of consideration. Was it a compromise for the Mercians to leave the hillfort and its prominent spur to the west of the dyke, so that longer-distance trajectories for monument could be established between the Eitha and Dee to the south and the Pentrebychan Brook and Clywedog to the north, without the earthwork being diverted (i.e. was it seen as a necessary compromise that the Mercians left this feature to create a blind spot in surveillance westwards)? Yet, as the maps in the latest book on the dykes by Ray and Bapty make clear, the dyke’s route bends considerably eastwards to avoid Pen-Y-Gardden. A fourth option to consider is whether prominent points were established both west and east of Offa’s Dyke as beacons and lookout points, in which case was Y Gardden actually reoccupied by the Mercians as part of a zone of defence of which the dyke itself was but one element? Only a small presence on the hill-top would cover this blind-spot and allow surveillance of those approaching the dyke for long stretches north and south. At present, I’m inclined to this view. What is striking is how flat the land is to the west of the hillfort, which makes me wonder how much advantage would have been gained by occupying it in relation to the dyke, other than to view along it and to prevent its occupation by enemies of the dyke’s defenders. I’m reading the new book Offa’s Dyke: Landscape and Hegemony in Eighth-Century Britain, and hope to refine my views as I do. What is sad is that this site, as discussed previously, has no surviving heritage interpretation. Offa’s Dyke is a late 8th-century linear earthwork (Britain’s longest), attributed to the Mercian ruler Offa (r. 757-796). To understand it, one has to have a copy of Sir Cyril Fox’s 1955 book, the last and only time the monument has been surveyed from one end to the other. This post reflects on my own observations and what Fox has to say. Last weekend, in cold and wet weather (but not as wet as this weekend), I went to explore a part of Offa’s Dyke I hadn’t visited before. It was a rare opportunity to get out into hitherto unexplored territory without kids in tow, so I decided to get out relatively early and explore some rather steep and muddy hillsides, in places still covered in a very thin layer of snow. The section of Offa’s Dyke I walked runs south from the Ceiriog valley at Chirk Mill (Wrexham) to Craignant (west-north-west of Selattyn, Shropshire). 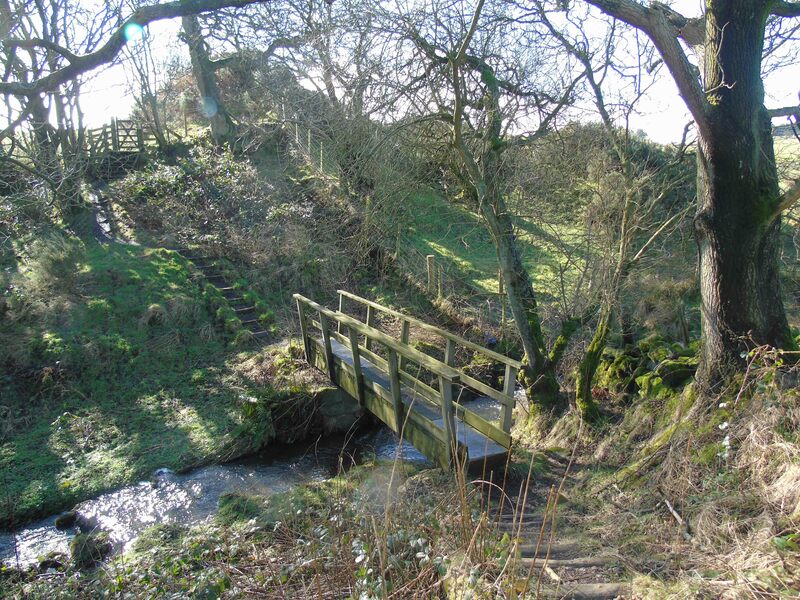 This section is particularly interesting because of the dyke’s relationship with the Ceiriog Valley at Castle Mill – the Gate of the Dead – and the fact that it traverses a steep ravine of the Nant Eris and crosses the Morlas Brook on its route to Selattyn Hill. This was also intriguing for me since for almost all of this distance, the dyke had unusually restricted views westwards over the territory it was built to defend against and dominate. Fox (1955: 79) refers to the general tendency of the dyke to follow western edges of plateaus, ridges and knolls, but also there are ‘remarkable examples of indifference to tactical position’. However, Fox did not see examples of this south of the Dee, where he regards that ‘practically all advantages offered by the terrain were seized’ (Fox 1955: 79) so that the power ‘occupying the lowlands desired to include within its territory key positions giving visual control of this part of the mountainous borderland’ (Fox 1955: 80). I wanted to get a sense of why Fox felt this applied to the Chirk-Craignant section when views were so restricted westwards from the line of the earthwork. 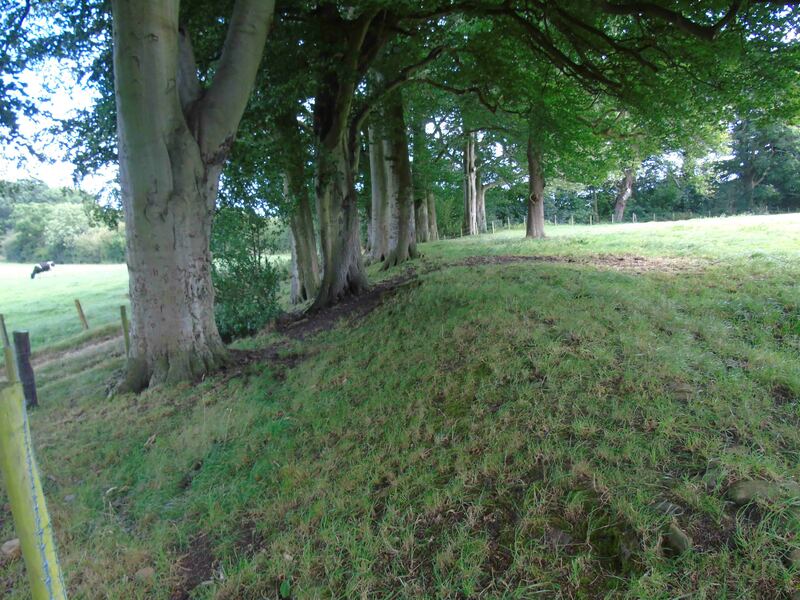 This relates to my research interests in the linear earthworks, which I have discussed most recently when I visited both Offa’s and Wat’s dykes near Ruabon. The trip was also useful to reconnoitre ahead of potential future student trips. I walked from south to north (the direction of description preferred by Hill and Worthington but counter Fox) and photographed over 2km of the dyke as it rose up from crossing the Morlas Brook at Craignant northwards uphill to Plas-crogan farm and then downhill to cross another steep ravine of Nant Eris. Then it rose again over a second hill before beginning its final descent, first gradual, then steep, down to the Ceiriog at Bronygarth. Fig. 24 The N. flank of the Morlas brook valley to the plateau S. of Orseddwen farm: on the boundary between Denbighshire (parish of Glyn Traian), Shropshire (Weston Rhyn and Selattyn parishes) and through Selattyn parish. Fox’s notes how the dyke disappears on the steep scarp descending to the Ceiriog valey bottom. 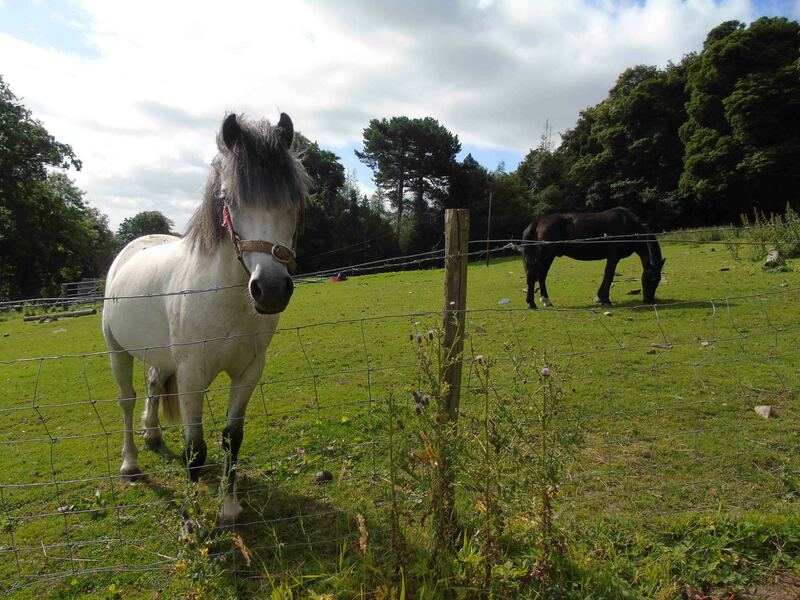 It remains lost in the Ceiriog valley bottom but then identified it for the first time in gardens and closes of Pen-y-bryn hamlet. Rising up the southern valley-sode, Fox describes how increasingly well-preserved this section is. From here to the Nant Eris stream, he describes it as having a ‘striking profile’ in places. Fox also notes an ’embayment’ to the west of the dyke, created by its diagonal ascent up the slope, affording ‘magnificent’ views up the Ceiriog valley. 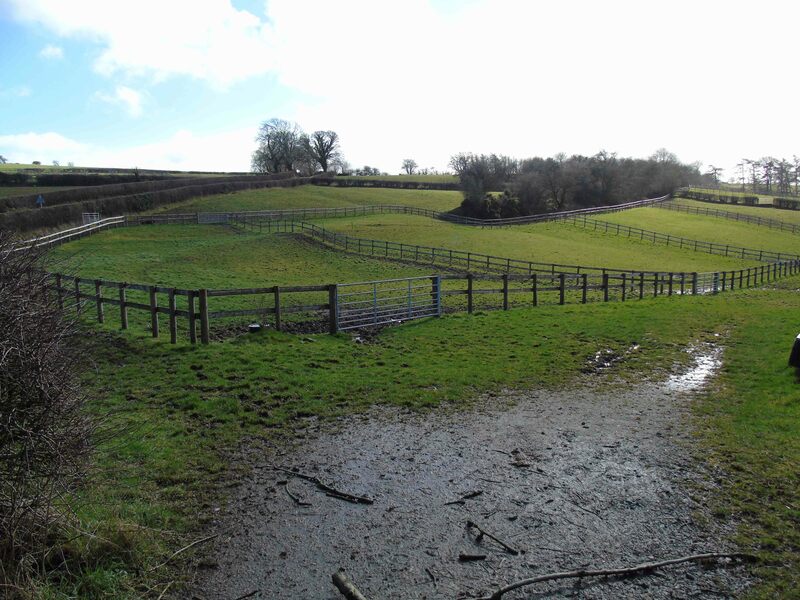 Further up, onto moorland pasture, the bank often retains its steep slope and its ditch retains angular contours. In places damaged by rabbits and foxes, it has been lowered by cultivation between the road and the Nant Eris ravine. 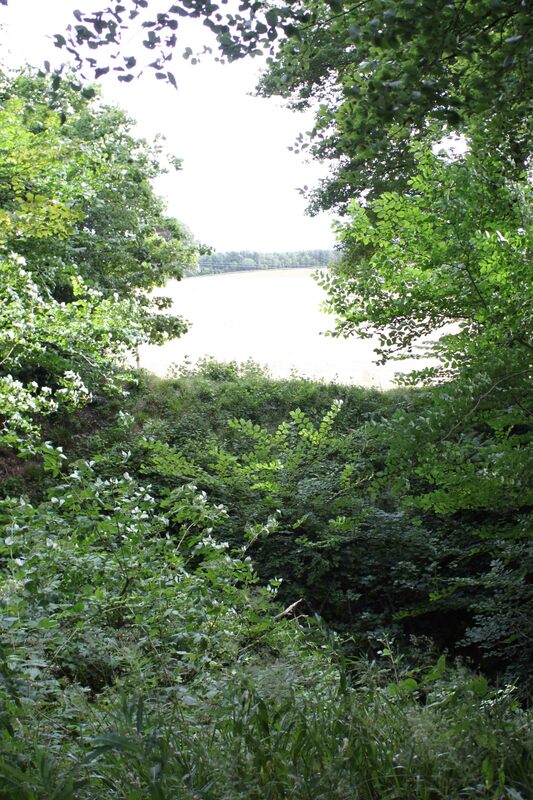 Fox also discusses the ‘remarkable appearance’ of the dyke as it rises steeply from the stream of the Nant Eris up the wooded scarp of the ravine with an ‘immense V-shaped ditch on the W. side silhouetted against the southern skyline’. Further south, around Plas-crogen, the bank is less impressive since it has been built of soil that has slumped but the ditch has remained intact, in some places over-deepened by water action as it descends to the Morlas Brook. Hill and Worthington note a specifically important point about the choice to cross the Morlas Brook where it does: to be downstream of a confluence with another stream. For this section, their commentary does not contradict that of Fox. 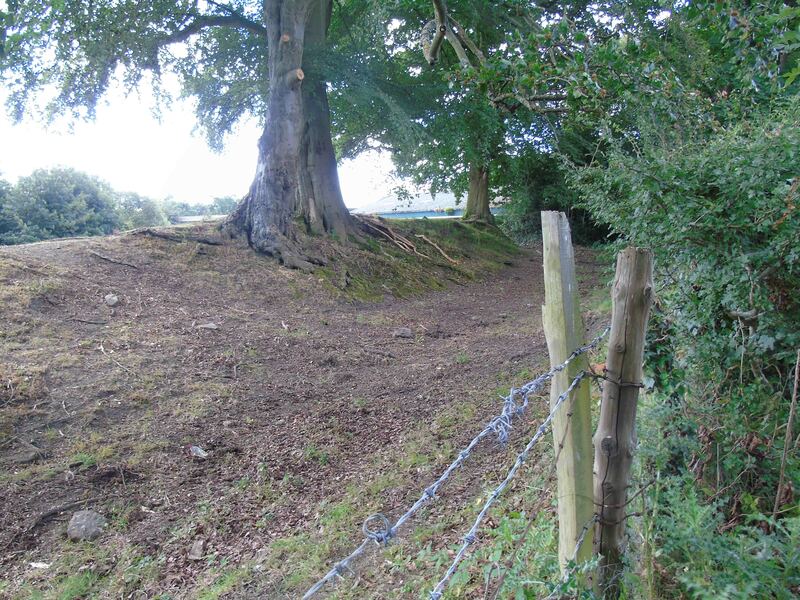 In addition, they conducted one excavation in this section, when Fox had conducted none (his nearest was north of Chirk). 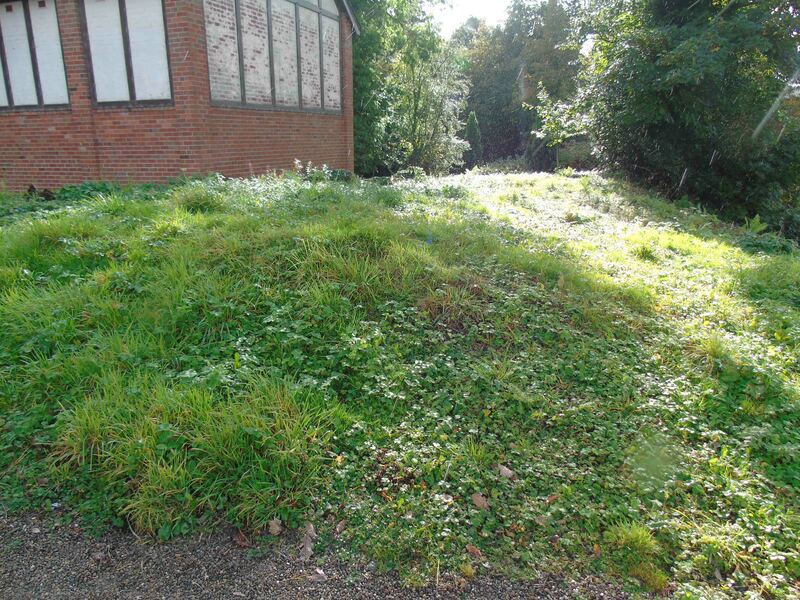 This is Hill and Worthington’s Site 63, Woodside, Selattyn – where they recorded a partial section of bank that had become exposed in the rebuilding work near a cottage cutting the east edge of the dyke’s bank. Half the width of the bank was exposed and a layer of large stones was noted at the base of the bank, with a layer of hard-packed clay with some overlying stones , all covered by looser clayey material (Hill and Worthington 2003). Based on these sources alone, I think I gain a sense of the narrow line of the earthwork itself and, in crude terms, a sense of its varying levels of survival. However, I don’t get a sense of how it was surveyed, organised and maintained. In particular, I think there are addition things to say about views from and of the dyke, and gaps in it. To do this, we must begin to look out from the dyke; considering the wider topography both west and east. I have now personally witnessed the gaps in the dyke required by the passage of streams at Plas Power (Nant Mill) and in this section at Morlas Brook and Nant Eris and can confirm that Fox was right to say that they were only a few yards across. The absence of the dyke at the base of the Ceiriog valley therefore must be, as Fox suspected, the result of alluvial action over the millennium since. I’m not convinced it was never there, seeing the nature of the earthwork coming down the sides of the valley and the breadth of the space left open were it to have not existed. One point of important that I haven’t seen observed by others is views to the east. 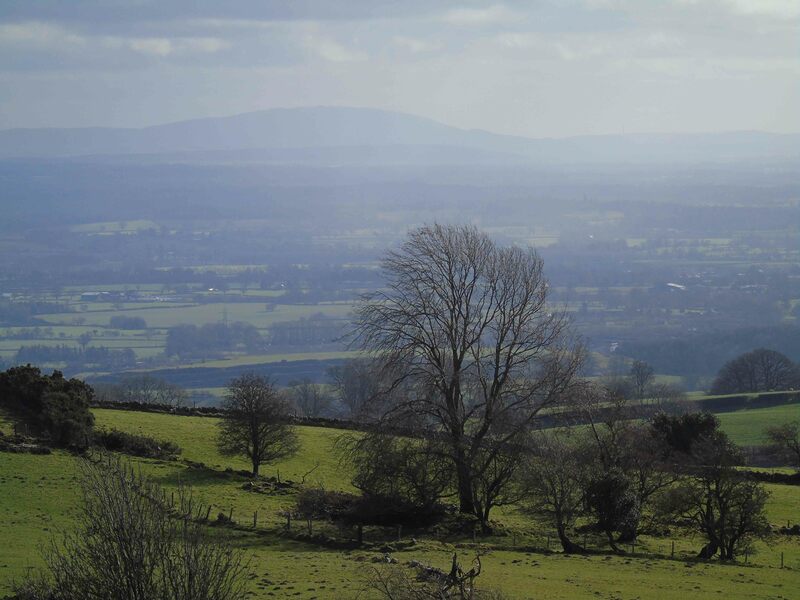 While Offa’s Dyke held views west, it also afforded views east over the Cheshire and Shropshire plains. In the key stretches on this section, views were afforded north-east to the Mid Cheshire Ridge and south-east towards the Wrekin. Was the dyke positioned as much to communicate east – forewarning these territories of unexpected movements of people, as much as dominate the west? Having walked this section of dyke, I am convinced that it cannot have made any dominant presence in the landscape to its west apart from its bisection of key valleys/ravines where it does, of course, block and dominate those approaching from the west. I would argue that this stretch of dyke is therefore an area of compromise between the need to retain the dyke’s long-distance orientation and trajectory and simultaneously maintaining long-distance views to the west. To retain longer distance views, the dyke would have had to have detoured significantly westwards to take in higher ground. Fox identified other sections like this to the north of the Dee. Yet I am surprised he didn’t discuss this stretch in a similar light as a part of the dyke that fails to achieve westerly views. These sections, do, however, enjoy views along the length of the dyke itself, allowing communication with possible lookout points just behind its line. 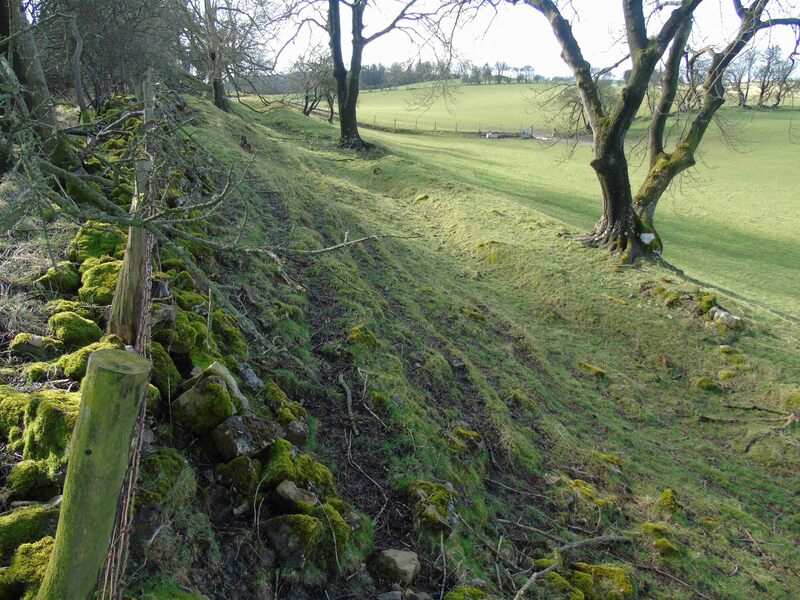 From parts of these upland sections, the dyke was observable, and communicable from any lookout point or fortification on the sites that were to later become Chirk Castle. Likewise, were there any station upon Selattyn Hill, approaches to the dyke at points where its view was restricted westwards would be flanked. I think that more attention is required to the importance of viewing along and behind the dyke in communication systems that helped defend it. As Keith Ray has recently discussed in lectures I have attended, and discussed in the imminently published book by Ray and Bapty, when approaching river crossings, the dyke bends to show off a united front to those approaching from the west. This is very clear on the slopes down to the Ceiriog near Bronygarth and must have been the case for the Morlas Brook, south of which the earthwork bends westwards to navigate Selattyn Hill and therefore overlooks those approaching along the valley from the west. In both instances, Fox does not fully recognise, as Ray and Bapty are now suggesting, the importance of display and reconaissance in the line of the earthwork when it enters valleys. In summary, I’m looking forward to exploring more of Offa’s Dyke. 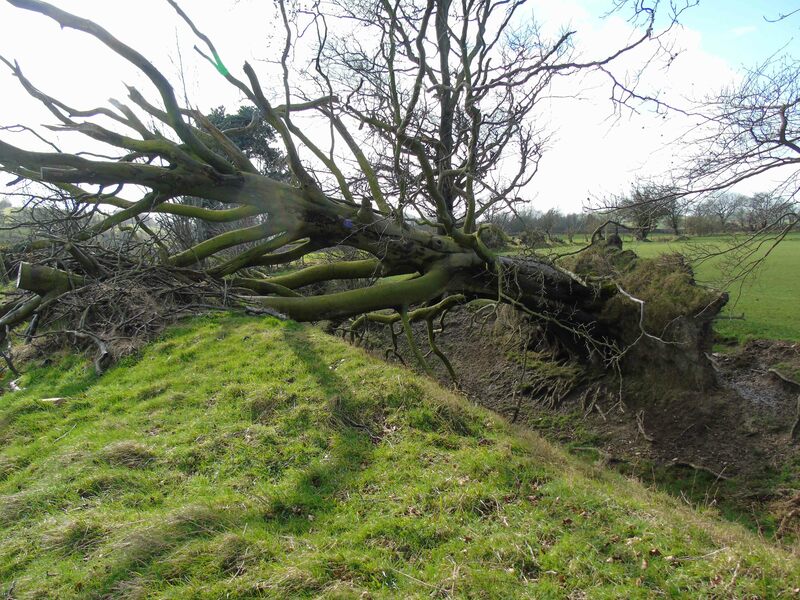 Offa’s Dyke has been destroyed or depleted over large sections. Without trespassing, there are large sections that have no public access and public footpaths run far from it. Where it is accessible to a footpath, on this section in particular, for large parts it runs behind the dyke or on it, thus facilitating only particular senses of the monument and how it operates. There are relatively few places I could easy get to see it from the west and appreciate how it was intended to look when approached by those wishing to move eastwards. I think these are some of the reasons why it still remains under-appreciated by the public and scholars, and its character and function, even if it is a unified frontier project as Fox says, are a challenge for us all. Fox, C. 1955. Offa’s Dyke: A Field Survey of the Western Frontier-Works of Mercia in the Seventh and Eighth Centuries AD, London: British Academy. Hill, D. and Worthington, M. 2003. Offa’s Dyke: History and Guide, Stroud: Sutton. Ray, K. and Bapty, I. 2015. 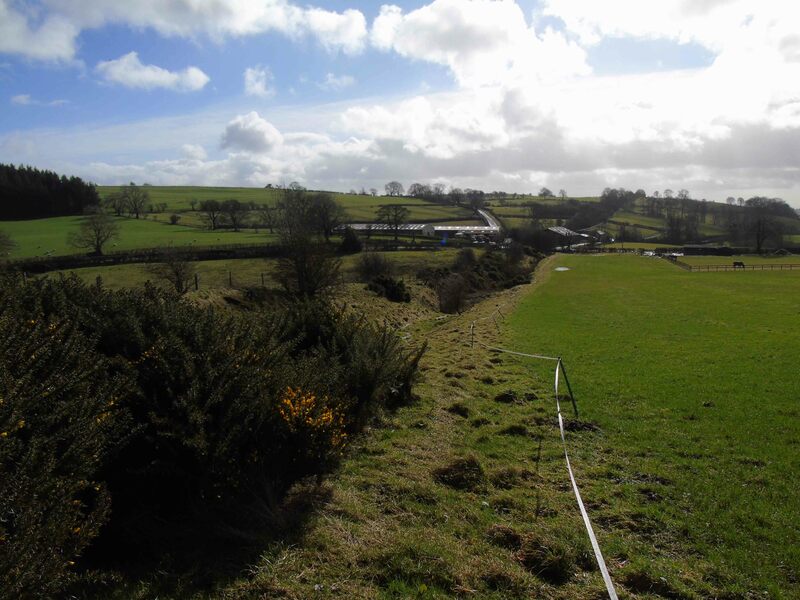 Offa’s Dyke: Landscape and Hegemony in Eighth Century Britain, Oxford: Windgather. I have a long-standing interest in early medieval kingship, kingdoms and communities and their monumental expressions, but very little time and effort spent thinking about and exploring linear earthworks. Hence, my recent conference presentation and ongoing research on Offa’s and Wat’s Dykes in the vicinity of the Vale of Llangollen is a new departure for me. I also confess that I have traversed only minor stretches of either dyke and I have little interest in walking its length (where it is possible) simply for leisure. Offa’s Dyke at the top of the southern bank of the Clywedog. I am standing on the dyke on the northern side of the river here. I recently went to Nant Mill for the first time. 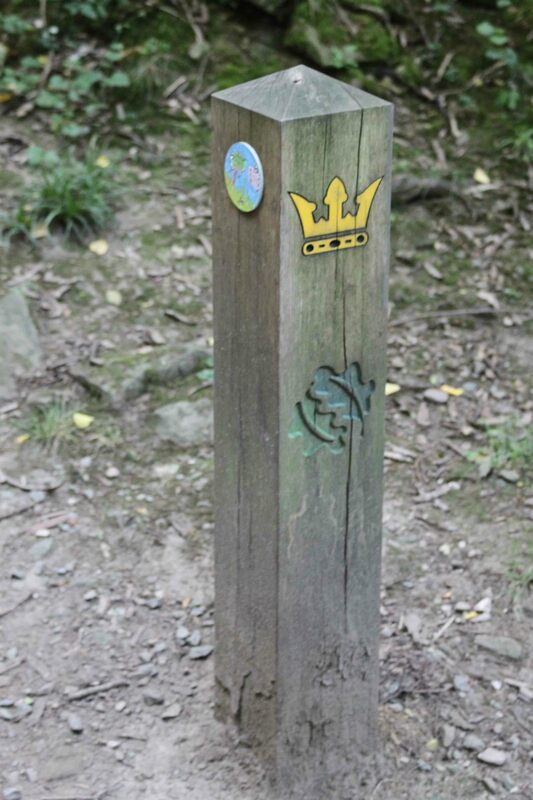 Later, I returned and I explored a short stretch of Offa’s Dyke where it crosses the Clywedog in Plas Power woods and I learned a couple of new things about the monument. how the monument does exist on valley bottoms where circumstances allow its survival. How panoramic shots are better than standard photographic focal lengths. In both practical and intellectual terms, my previously stated point still stands: Offa’s Dyke is often just too big to apprehend and comprehend. I clearly have far more thinking to do about this monument and look forward immensely to the new book by Keith Ray and Ian Bapty on the subject. There is also a heritage point to be made. The line of Offa’s Dyke here hits Plas Power woods: a tract of wooded valley managed by the Woodlands Trust and of significance for its industrial heritage, its use as a recreation area for local communities. There have been efforts to connect history and conservation. 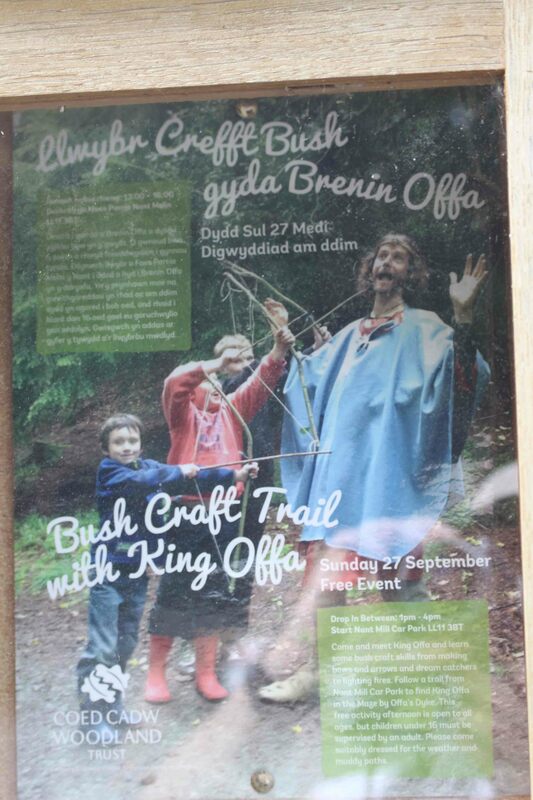 There is also a wooden sculpture of King Offa close to the monument bearing his name. For me, it is the linkage to local communities and these linear earthworks that fascinates me, more than their significance as long-distance footpaths, often going nowhere close to the early medieval monuments. I’ve just finished reading Keith Ray and Ian Bapty’s fascinating new book: Offa’s Dyke: Landscape and Hegemony in Eighth-Century Britain, published by Oxbow. Hence, Offa’s Dyke is foremost in my mind. The monument is under threat of destruction along its line – from ignorance, neglect and irresponsible (sometimes criminal) behaviour. 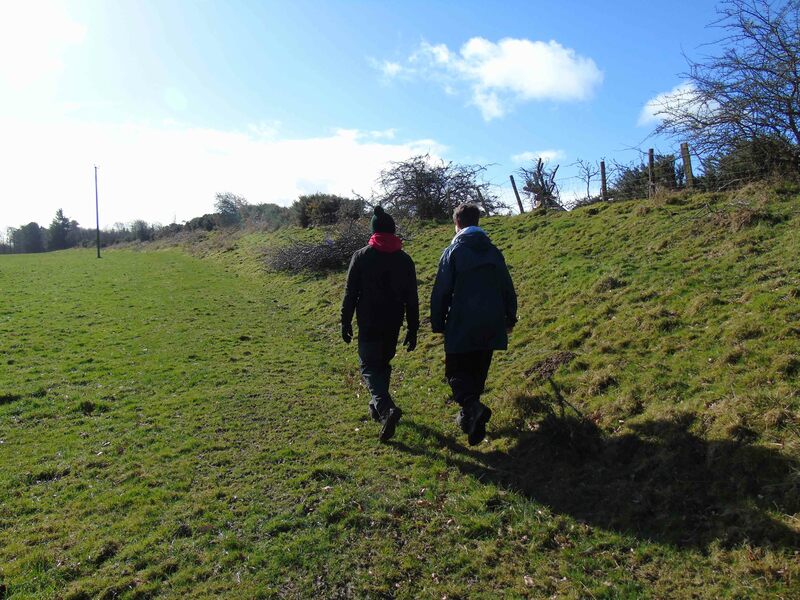 It is still misunderstood by many early medieval archaeologists, let alone the general public, and Offa’s Dyke is poorly served by heritage professionals and organisations. In many parts of its length, there is no, or very little, or very poor, heritage interpretation and on each side of the modern border, archaeologists have fought a long rear-guard action to conserve the monument. Offa’s Dyke is hindered, not helped, by its historical interweaving with the Welsh-English border. This is of course, a perverse state of affairs and underscores the importance of ongoing efforts to research and engage communities with this important monument. I’m a regular visit to Chirk Castle and its gardens and previously I’ve posted about its canine commemoration. The site is great, the staff are great. Because I’m such a fan I’ve tried to hold back on this rant, until now. 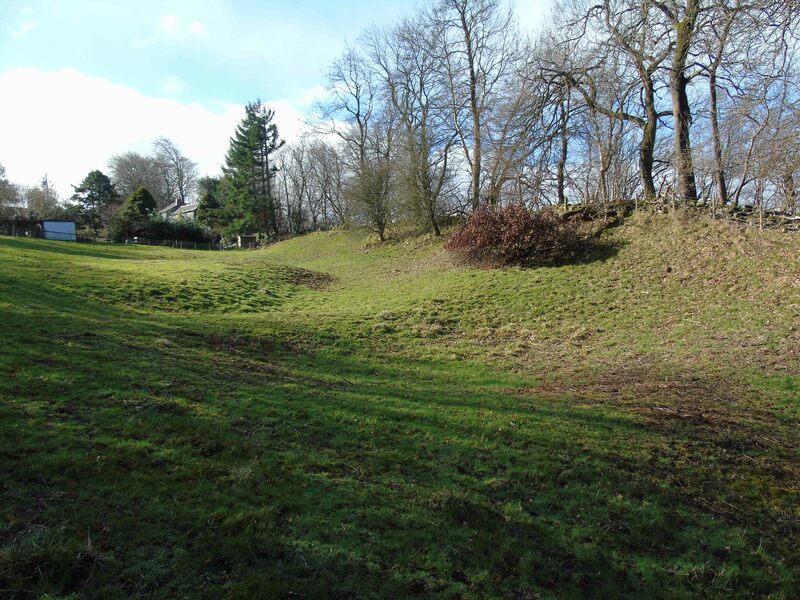 However, Chirk Castle woefully present their oldest and greatest feature: Offa’s Dyke. 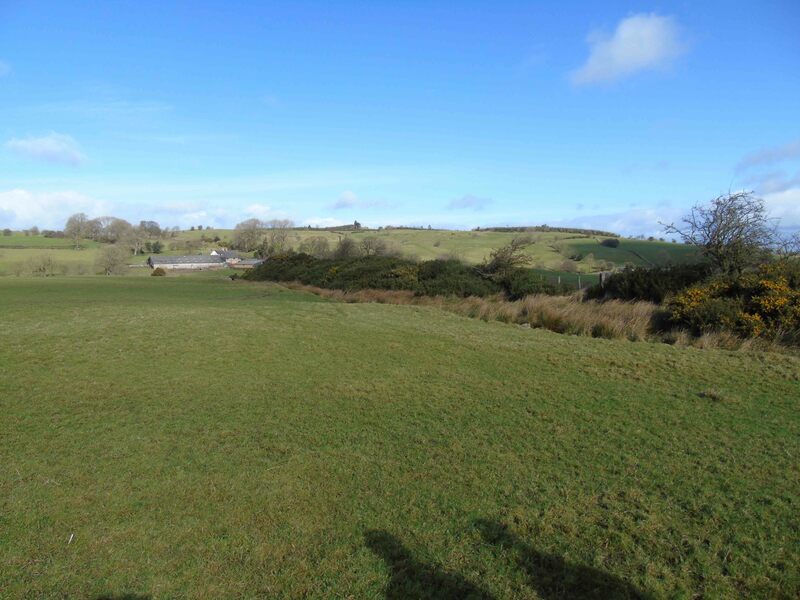 While heavily denuded near the car park and Home Farm, it is a key component of this landscape as it faces higher ground and then the steep northern slope of the Ceiriog. 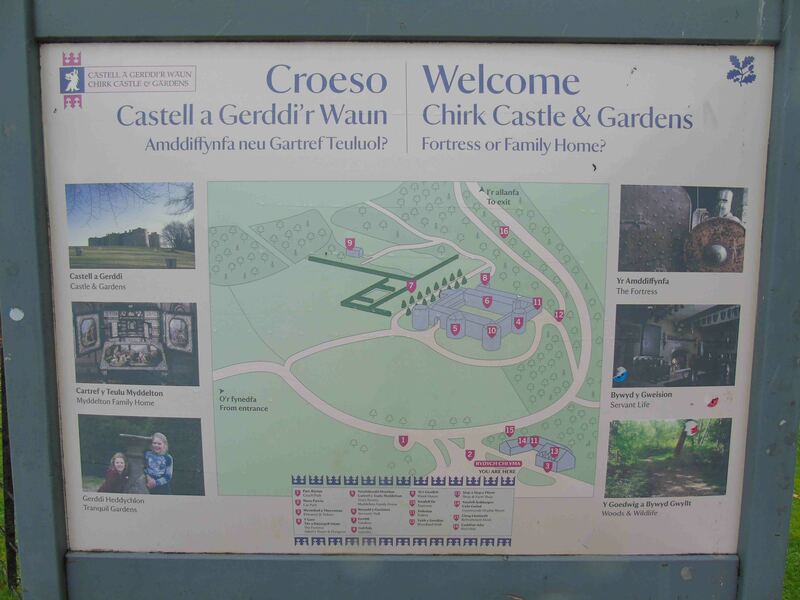 Almost every one of the thousands upon thousands of visitors Chirk Castle must receive each year drive over Offa’s Dyke to get to the main National Trust car park. They then cross its line again on the walk up to the castle. 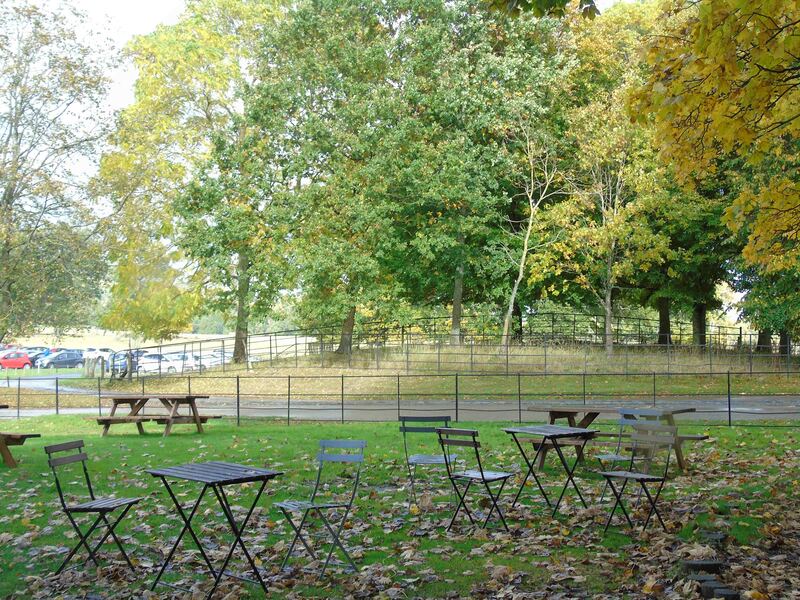 They might stop and let their kids play upon it in an adventure play area beside the small cafe at home farm. 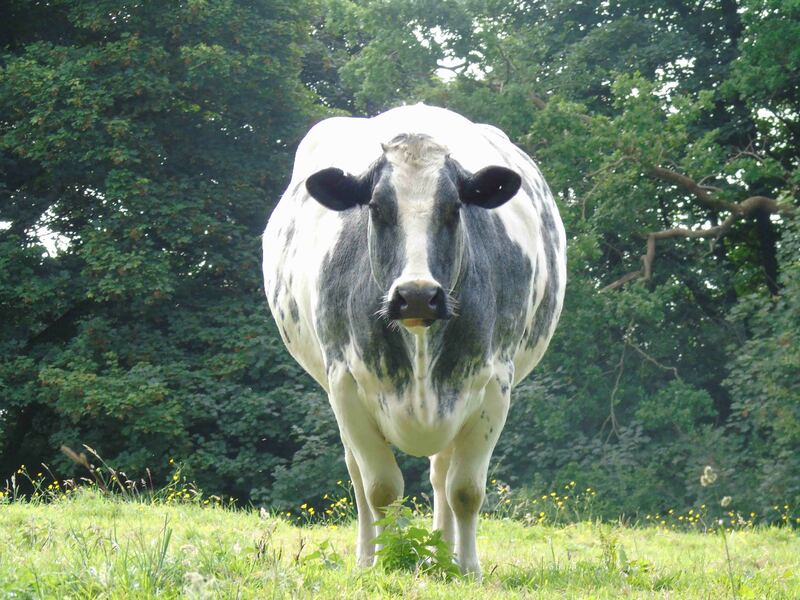 They might encounter its earth and bank and cross its line if they detour to visit the dovecote and kitchen gardens. 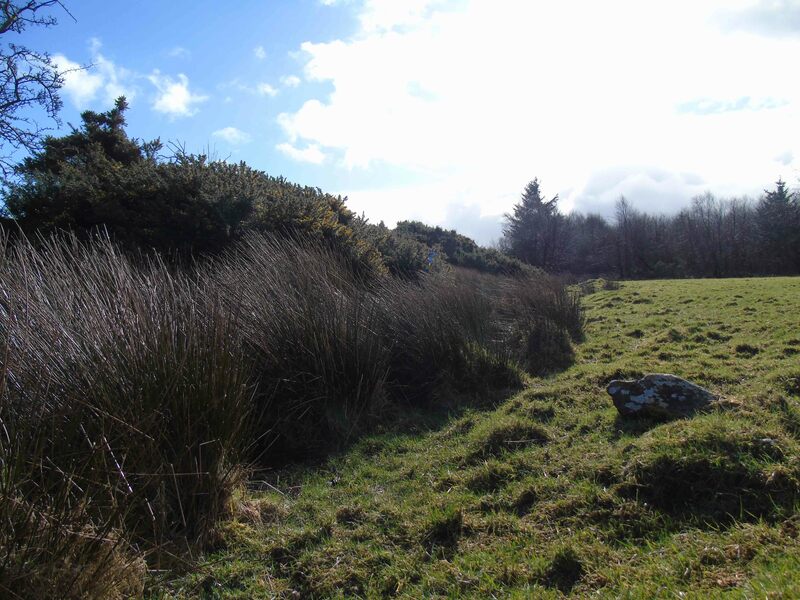 There are two longer walks within the grounds that allow visitors to see better-preserved sections of the Dyke, including the walk down to the Ceiriog. Then, on their way out, they have to cross it walking back to the car and driving off. Heavily wooded, Offa’s Dyke descends to Crogen from Home Farm. Note: this is not on NT property: this is a permissive path. 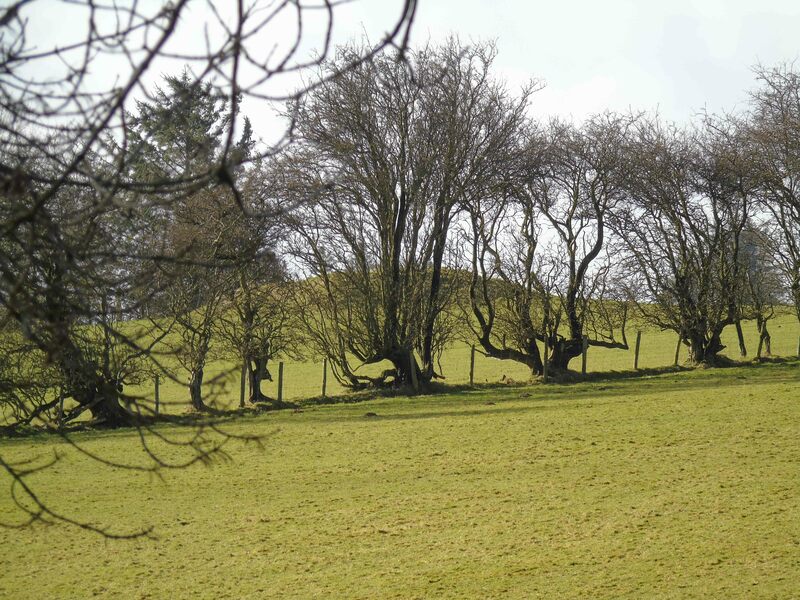 Bisecting the estate is a section of the remarkable 8th century defensive earthwork Offa’s Dyke, built by King Offa of Mercia to mark the ancient border with the kingdom of Powys. 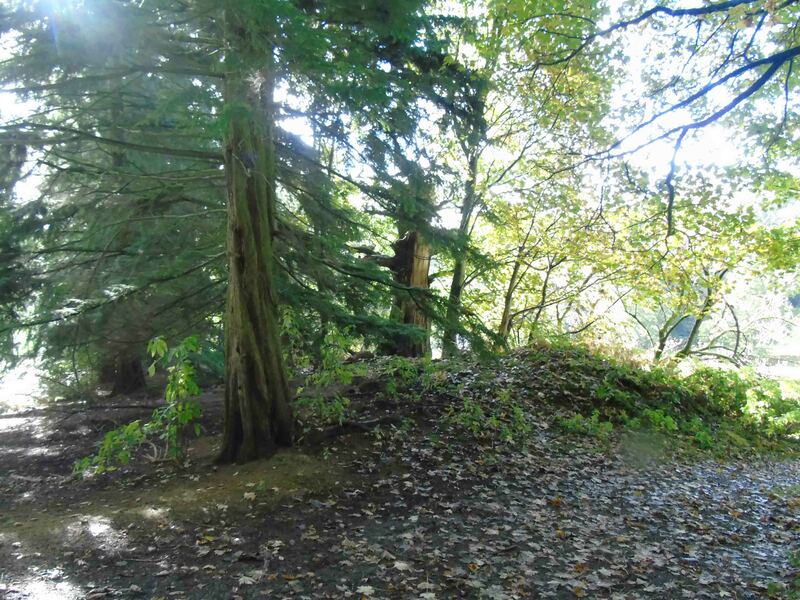 When you drive into the car park at Chirk you will cross Offa’s Dyke, although you may not notice – William Emes levelled vast sections of it as part of his uncompromising work on the parkland. 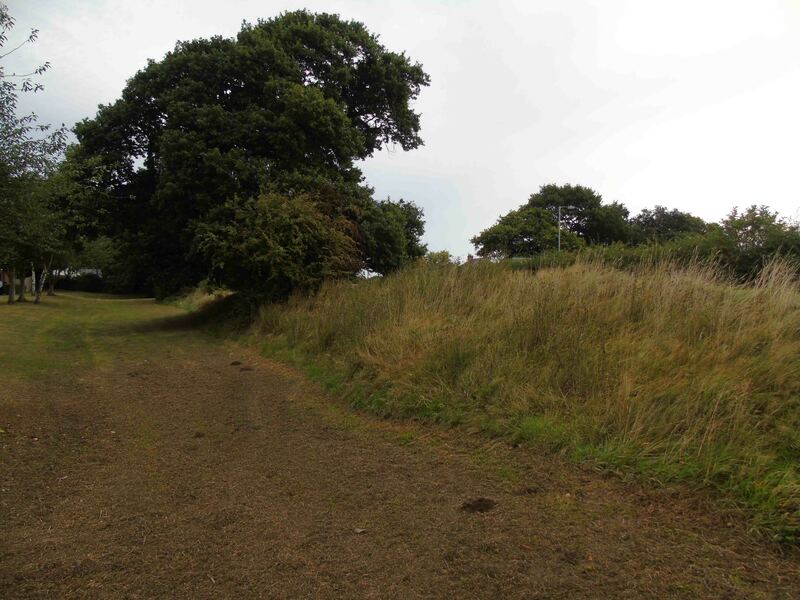 A fantastic section of the dyke still exists in the medieval deer park, which is accessible from March to September along a permissive path.,and that visitors will cross it. Also, the map vaguely shows the dyke with a near-illegible drawing of a ditch and bank, situated. 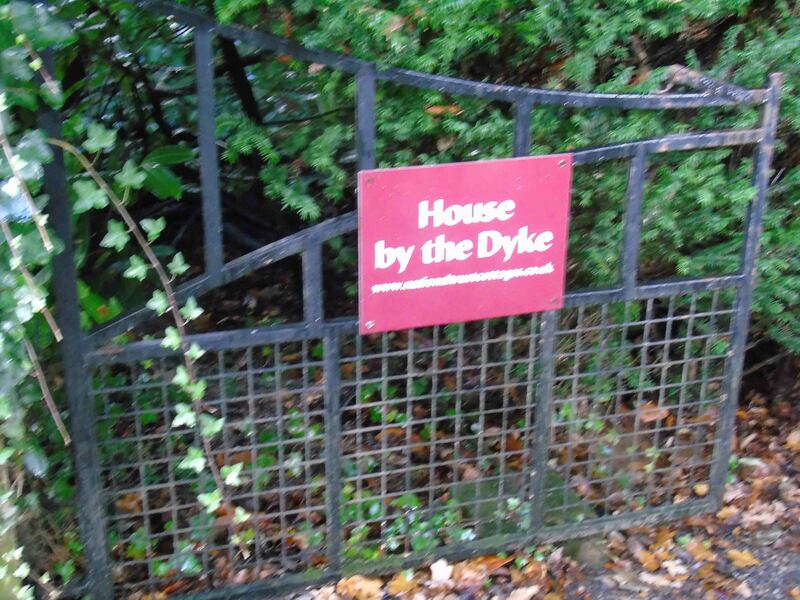 I also accept that there is brief mention and visualisation of the dyke on one sign board. Still, upon the map given out to visitors, and on key information, the dyke is ignored. There are no signs identifying it. Hence, I suspect most visitors don’t know it is there. Indeed, while I recognised, as an early medieval archaeologist, the line of the dyke in the field next to the car park, I visited many times before I fully realised its course continued down to the Ceiriog through Home Farm! I cannot accept this is a sufficient state of affairs for a modern visitor site. I wonder whether I’ve missed places and dimensions to how Chirk Castle promotes the presence and significance of this monument for understanding the early history of the Welsh border and the specific history of Chirk and its environs. Chirk NT have been in touch with me, having read the above blog entry. I’m pleased to learn that they are already fully aware of the challenges I raise regarding the presentation of Offa’s Dyke. 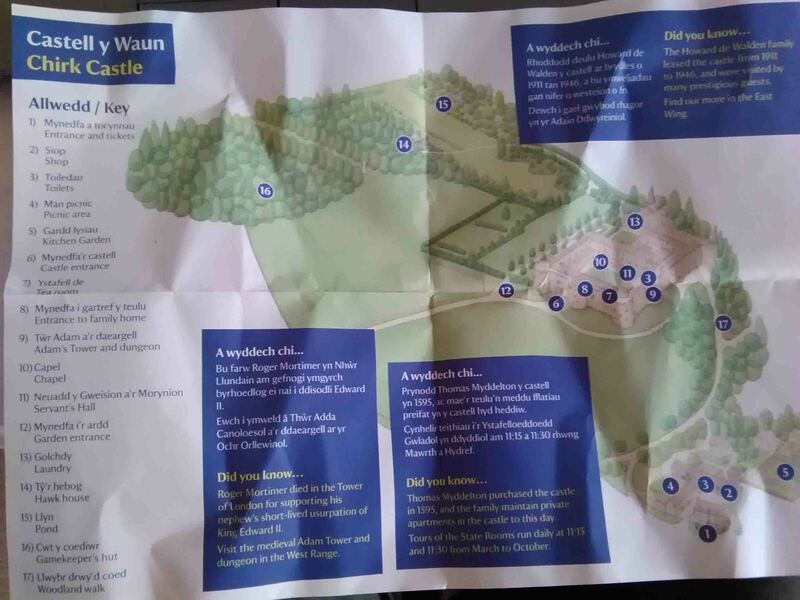 They have plans in place to enhance the maps and signs in response to how visitors are using the Chirk estate. 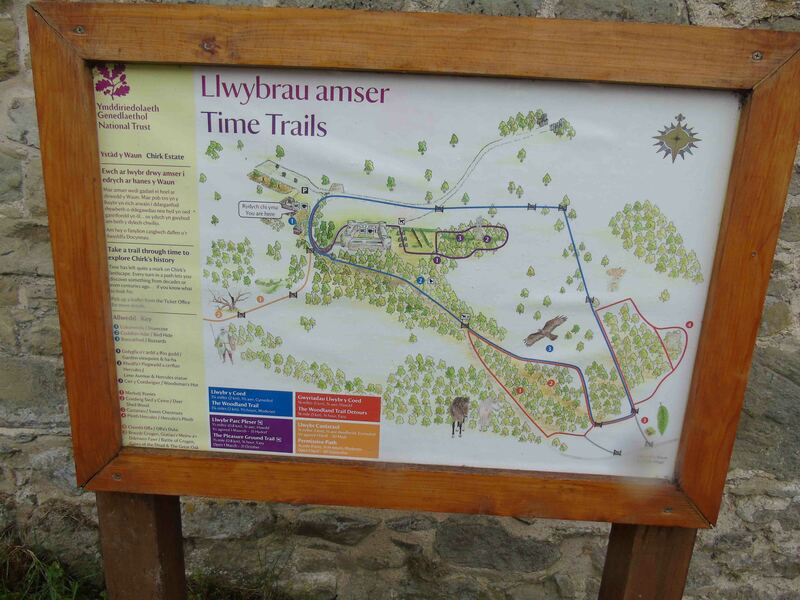 In particular, they have a clear and positive vision of enhancing how visitors experience Offa’s Dyke. Re-posted from Professor Williams’s Archaeodeath blog. 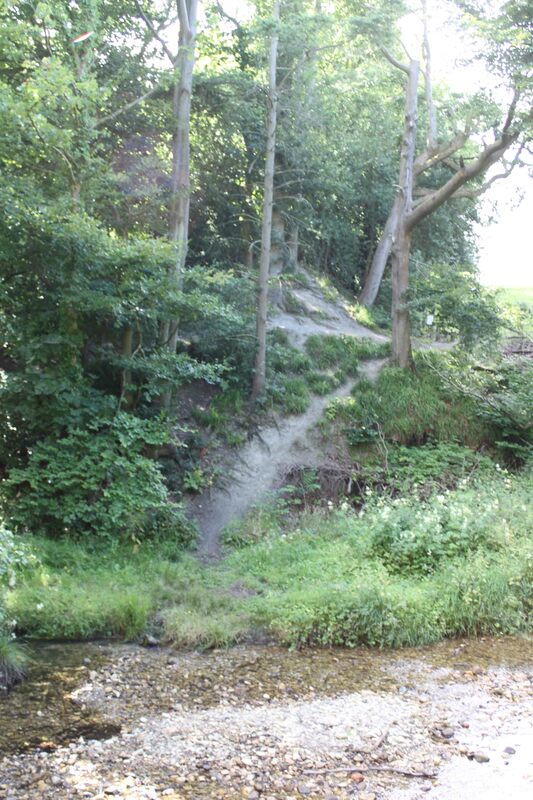 In the photographs you can see the much-denuded but still-discernible traces of Wat’s Dyke – a bank and a ditch. We were just taking photographs and talking about the significance and date of this monument – now regarded as likely dating to the early 9th century as discussed here – when a resident engaged us in conversation and discussed the monument. As well as working at a nearby university and being extremely interested in the monument. 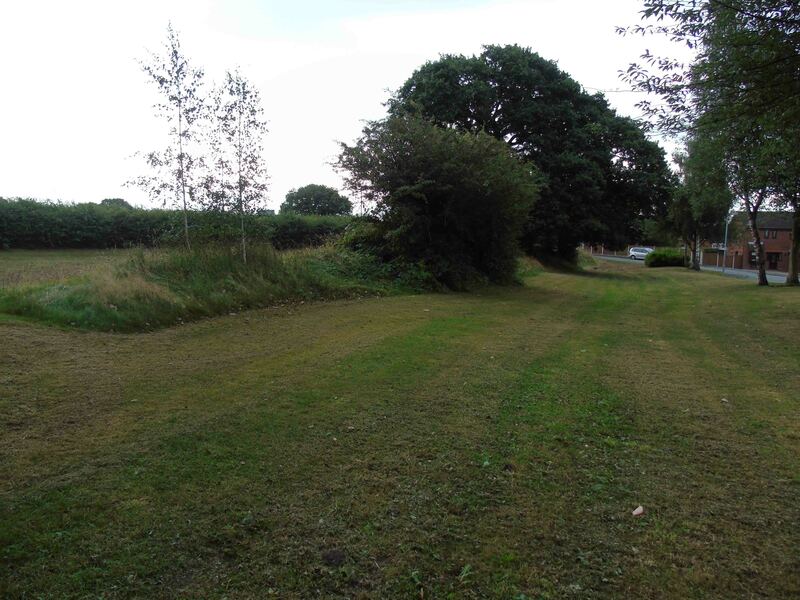 Significant for this post, she kindly pointed out that, part-hidden within foliage beside the earthwork is a memorial stone, erected to coincide with the building of the new estate, marking the supposed significance of Britain’s second-longest linear earthwork. I hadn’t noticed or realised that the earthwork was actually ‘commemorated’ in this fashion with a large stone! I’d visited this spot before, even viewing a house within the estate, and never noticed the stone! Indeed, to see it, you have to approach on foot from the houses themselves; this isn’t for tourists or anyone else to see. I have talked about the barely visible heritage signs for Offa’s Dyke and Wat’s Dyke at Ruabon, but this represents another dimension: a monumental commemorative stone for one of the dykes; in plain view and yet still part-concealed. Given this spatial and semi-public dynamic, might this a new form of monument/memorial that might be called a ‘residential monument’?